The “Wishbone” Found In Holiday Turkeys Is The Birds’? At Thanksgiving, millions of Americans partake in many holiday traditions, like eating roasted turkey, eating pies, and even—though a bit more obscure and less practiced these days—pulling apart the turkey’s “wishbone” to make a wish. The wishbone, formally known as the furcula (Latin for “little fork”), is a mysterious and very symmetrical bone found in turkeys that doesn’t appear to have an immediate analog in the human body. Furculas are found in bird species (and not every bird species at that) and are a fusion of the bird’s clavicle bones that strengthens the thoracic skeleton so that it can withstand the rigors of flight. Before we leave the matter of snapping the wishbone for luck and wish-granting, let’s not leave you believing that the practice is an American invention. 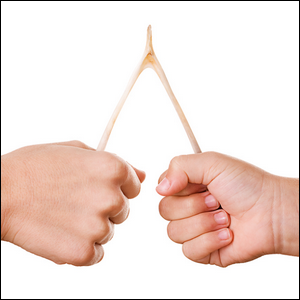 A preoccupation with the magical power of the wishbone well precedes the tradition of the American Thanksgiving feast by thousands of years. The practice of snapping the wishbone came to America by way of English settlers, who in turn inherited the tradition centuries earlier from the Romans who occupied their lands (the first to practice snapping wishbones rather than just touching them), and in turn the Romans adopted the practice even earlier from the Etruscans, an even older civilization found on the Italian peninsula. The Etruscans believed chickens had divination powers and even after they had used the living chicken as part of their divination rituals, they would lay out the furcula in the sun so that people could touch it and make wishes on it. So the next time you snap the wishbone to make a wish, you’ll know that the real reason you’re doing such a strange thing is that thousands of years ago, people in Italy thought chickens could tell the future and grant, genie-like, our desires with their magical bones.